Maryland Horse Rescue View other Horses for adoption. Gabriel is a Quarter Horse gelding born in 1997. 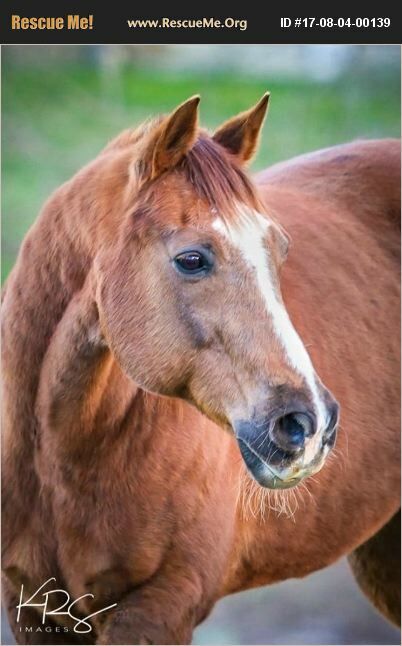 He is chestnut with a white blaze and stockings and stands at 15.3 hands. Gabriel was found abandoned along with four other horses and taken in by Freedom Hill Horse Rescue (FHHR) in early 2017. He has extensive western show experience and neck reins. Gabriel gets a little anxious at feeding time and paws the ground due to past neglect. He needs to be fed alone and in a stall for a calm eating experience. He stands for the vet, farrier, dentist and does well being trailered. He loves being groomed. Gabriel can be ridden lightly with proper treatment for on and off lameness due to arthritis. Gabe is currently shoed.